While we see messages promoting a fun, extended weekend, barbecues and sales, Memorial Day is not a happy day for millions of Americans. It’s not a celebratory day to have fun. It’s a somber day to remember those who died while serving in the nation’s armed forces. And while it’s become traditional to have fun and sales during this time, it’s also important to be respectful and honor those who serve and the families of those who serve. 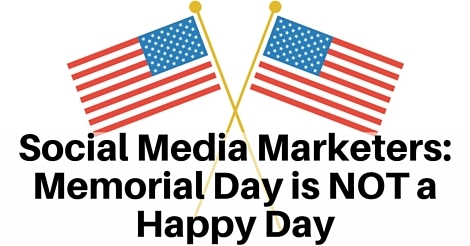 There are many who will defend using the word “happy” in a Memorial Day social post, but keep in mind the backlash companies have gotten from doing so. Is defending your business and reputation something you want to spend Memorial day weekend doing? I never understood why we put “Happy” in front of Memorial Day. It is a time of mourning and remembrance. Just as a reminder. It’s not “Happy” Memorial day. Memorial day is a day set aside to remember those that have died serving our country. Happy Memorial Day? What is so happy about today? Families are missing and remembering their loved ones that fought for our freedom. The ones that fought for you to be able to be free and where you are today . Not to hate but a reminder .. Memorial Day is to celebrate the lives of the brave men that lost there lives to give u this wonderful life u r enjoying ..so it’s not a happy day .. Sad day to the mothers and children that list there fathers .. So please respect this day .. Happy? There is nothing happy about this day. It’s a day for reflection. Poor choice of wording for such a day. May I suggest purchasing a copy of 100 Questions & Answers About Veterans so that you will read why the statement “Happy Memorial Day” is really offensive to many veterans as well as thanking them for their service. Final verdict? Be respectful and honor those who died in the line of duty as well as their families and save “happy” wishes for more appropriate occasions. Want some more examples? Check out these Memorial Day social media fails from the Observer. Previous Previous post: Is Your Dealership’s Online Reputation Ruining Your Business? Next Next post: Reputation Check: Negative Reviews Are Costing You Business!